Changing the Energies in Your Home This Season! Thursday September 19, 2013 Danni and I will be hosting a Live Radio Program at 9:00 PM ET, 8:00 PM CT, 6:00 PM PT, where we will be discussing Smudging. This is a powerful cleansing technique. It is a ritual to remove negative energies and have them go in smoke to the Great Spirit. Smudging can be used to cleanse your spirit, mind, and body. It can also be used to cleanse a house, building, vehicle, work place, or another person. We will also be answering your questions so join us for this exciting hour as you learn how to cleanse your spirit and be renewed! The number to call in and ask questions with is: (347) 994-2531. Click here for Details on the program. If you miss the live program you can always listen to it in the archives and it’s available 24 hours a day. By the time many folks start investigating crystals, they may have been through some scary or at least challenging times in their lives and looking some relief, quickly if possible. It would be convenient if we could simply pull out The Healing Crystal, but I’m afraid that it’s not that simple. A bit more education is in order before the best crystal or mineral can be selected for the kind of help that is being sought. What I suspect that most people are referring to would be the clear quartz crystal that most every one has seen at one time in their lives. Many practitioners that use crystals and minerals for healing work would agree that the quartz crystal in various shapes and sizes is truly one of the most versatile and useful crystals the earth has to offer. Metaphysically, the quartz crystal can be easily programmed to help provide a positive outcome. It can clear away negative energy from the aura and re-align the chakra (energy) centers of the body. It can be useful in long distance healing through imaging and meditation. It is beyond the scope of this article to have a full discourse of quartz crystals. You can find many books written about crystal healing and you will see that discussion of quartz crystals in these books usually takes a lions share of the space, and rightfully so. Because it is relatively easy to learn the color healing system, and once it is learned you can use it to quickly identify what crystal or mineral to use for specific healing. The use of color to create or alter certain emotions or moods has long been an excepted practice by many traditional professional mental health doctors and care givers. 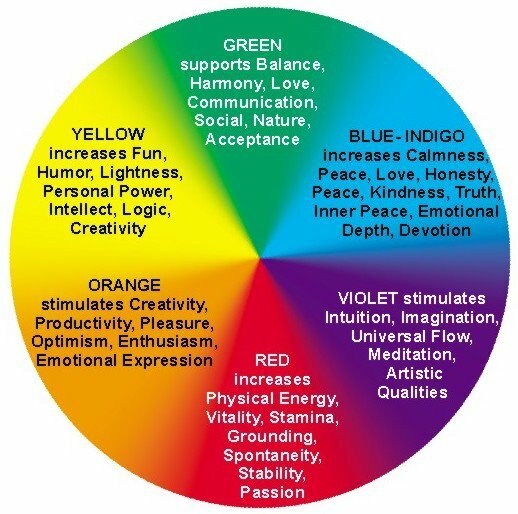 We also borrow from ancient eastern culture to further associate these colors to the various chakra centers in the body. A chakra is an energy center of which there 7 major centers starting with the root located at the base of the spine and ending at the crown of the head. Each chakra has an associated color (or colors) and each of these colors can be easily associated with the colors of the crystals or minerals which affect that area of the body. Primary color is orange, others are all various shades of orange. Primary color is yellow; others are various shades of yellow. Primary color is green and shades of green, the secondary color is pink. Primary color is dark blue or various shades of dark blue. If you can memorize (or print-out) these associated colors with their chakra centers, you can then go anywhere and pick out a crystal or mineral that will help with the affected area. Now having said all of that, you must remember that each kind of crystal and mineral can and does have other transformational properties that are specific to that crystal or mineral. But in the meantime you now have enough information to make a reasonably good pick by using the associated color method. It has been shown through Kerlian photography that the aura or energy fields surrounding objects extend a considerable distance from its core. This greatly applies to crystals and stones. OK, OK, but how do they actually work?? Fact is I don’t really know, but it must have something to do with the greater god consciousness that is beyond words or speech. I know that there are nice folks out there in the world that would never believe that a rock or such could ever help them in any way. In Native American teachings it is accepted that everything is alive and that includes crystals and rocks. There is an energy that is associated with everything. If it is true that we actually live many many lives and reincarnation is fact, then these people are simply in a particular incarnation that precludes them from having such beliefs (this time around). Personally I believe that crystals can be effective if we empower them to help us. They work on the subtle energy level at our core and out in our auras. Crystals can be used in conjunction with conventional treatments, and can be seen as pro- active step in-between doctor visits. There are many ways that we can help ourselves to heal and participate in our own recovery, using crystals is surely one of them. Quartz Crystals can be used during your meditation or your everyday life. Due to their really high vibrations they affect your energy field to a great extend helping you keeping your vibes as high as humanly possible! If you would like personal guidance on the use of crystals and Chakras contact me, Cherokee Billie , and I can help you learn the wonderful techniques of healing by the use of these modalities. Do You Believe In Magick Spells? Magic, miracles, manifest themselves every day. Recently I was looking up the most hit keywords for my website and I put in the keyword “love psychic.” Well what popped up was “Love spells.” That keyword is far more popular than anything to do with psychic readings. Apparently people are paying for love spells and it is a large moneymaking industry. Here is what I know; the only magic that exists comes from The Divine Creator and the Angels. By paying for a magic spell you are taking the power away from Spirit and yourself and giving someone else control in your life. You are enabling someone to have power over your life. The Kingdom Of Heaven Is Within You! If you truly believe this you would understand that you have the connection to the Divine Creator and that your prayers and thoughts are far more powerful, because you have the connection, than someone you do not know casting a spell for you. All Prayers are heard. You may not get exactly what you want, but The Creator knows what you need for your personal growth. Prayers are answered in many different ways. Remember negative energies attach themselves to people and you can take care of removing the negative energy from your life, but how can you remove it from someone who is casting a spell for you? By paying for a magick spell you are saying that someone else is more powerful than you and that you are helpless. This is playing with your life and you should not turn control over to someone else. If you have fallen in love with someone it is your free will at work allowing you to choose love. It is important to remember that free will is one of the main players in romantic love. There is no magick spell that can cause someone to love you. If you think about it would you really want someone to love you because of a magical spell? No, you would want them to love you for you. For more information read my article on The Free Will of Love. By receiving a psychic reading you are not giving control of your life away. The psychic is merely telling you what the potential for the future can be. The person receiving the reading can take the information they receive and do with it what they choose. There is nobody controlling them. Before you plunk down your money for a magic spell why don’t you contact the Divine Creator, the Ancestors, and the Angels first and see what they do for you. Miracles happen every day and your miracle could be on its way to you right now! Thanks to Tarryn many of you expressed interest in crystals and stones. I thought I would give you a bit of a teaching to help you understand why crystals and jewels have long been recognized for their protection and healing capabilities. Primary color is red, other colors associated with the Root Chakra are black brown, and gray. Primary color is yellow, others are various shades of yellow. Primary color is light blue like aqua or turquoise, secondary colors are various shades of lighter blues. Primary color is purple, the secondary colors are shades of purple and colorless (clear) or white. Now having said all of that, you must remember that each kind of crystal and mineral can and does have other transformational properties that are specific to that crystal or mineral. When you want to acquire more in depth knowledge about these properties, buy or check out one or more of the many books that cover this subject. But in the meantime you now have enough information to make a reasonably good pick by using the associated color method. OK, OK, but how do they actually work ?? Fact is I don’t really know, but it must have something to do with faith, believing, imaging, and the greater god consciousness that is beyond words or speech. I know that there are nice folks out there in the world that would never believe that a rock or such could ever help them in any way. If it is true that we actually live many many lives and reincarnation is fact, then these people are simply in a particular incarnation that precludes them from having such beliefs (this time around). Unfortunately, pain is one of our great motivator’s and equalizers. This could be physical or emotional pain, but it does have a way of getting our attention, and opening our minds to things which may give us some relief from this pain. But it’s not always pain that gives us incentive to search beyond our past experience for new solutions or answers. Sometimes it’s just a need to break away from old habits, maybe find a new career that can be fulfilling, or to find a new mate with which we will be proud to share our lives. Personally I believe that crystals can be effective if we empower them to help us. They work on the subtle energy level at our core and out in our auras. Crystals can be used in conjunction with conventional treatments, and can be seen as a pro- active step in-between doctor visits. There are many ways that we can help ourselves to heal and participate in our own recovery, using crystals is surely one of them. Cherokee Billie on Elvis Presley’s 84th birthday! Tarryn on Elvis Presley’s 84th birthday!